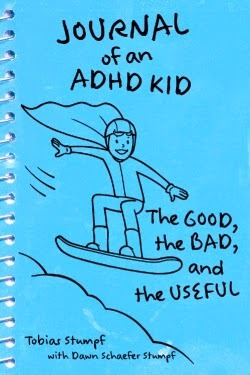 Disclaimer: I was provided with a copy of the Journal of an ADHD Kid for review purposes. No compensation was received. All opinions are my own. Journal of an ADHD Kid: The Good, The Bad and the Useful by Tobias Stumpf with Dawn Schaefer Stumpf. Toby, the narrator, relates his experiences coping with ADHD in an authentic kid’s voice, providing plenty of solid information, emotional support, and tips for kids and teens! While Norrin isn’t quite ready to read Journal of an ADHD Kid – I learned a lot about it and I can’t wait to share this with Norrin one day. Journal of an ADHD Kid is written specifically for kids and it’s written by a kid with ADHD. The intro explains that Toby was inspired by Jeff Kinney’s The Diary of a Wimpy Kid and immediately you see the influence – which will definitely appeal to kids. Each chapter is a few pages long and they tackle the real everyday concerns. What I appreciate about the book is that it’s more than just one kids’ experience with ADHD. Many of the chapters end with checklists or Q&A – allowing the reader’s experience to be part of the book. It’s also fun to read. One chapter explains different kids of ADHD by comparing it to pizza. “…just like there are different kinds of pizza, there are different types of ADHD.” And because it’s written by a kid – it touches on subjects that resonate with kids. Like video games, getting in trouble at home, not liking homework – all “normal” stuff. Toby is honest about ADHD. While he doesn’t consider it to be a “gift,” he does recognize that it’s a part of who he is. It’s a journal of understanding and self-acceptance. Not only is Journal of an ADHD Kid a valuable learning tool but, it’s a great way to jumpstart an honest conversation about ADHD. Journal of an ADHD Kid is available at www.woodbinehouse.com.